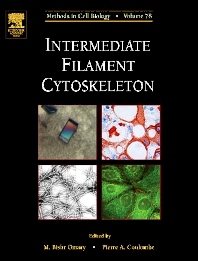 Intermediate filaments are a large family of proteins that are the cytoskeletal elements involved in a number of skin, liver, neuromuscular, cardiac, eye and hair diseases. Intermediate filament genes are regulated in a tissue-and cell type-specific manner and their polymerized protein products protects the cells and tissue they are part of against a variety of mechanical and nonmechanical stresses. This book provides a comprehensive resource of methodology essentials, describing a variety of essential tools and assays for studying intermediate filaments. The book provides user-friendly advice and protocols covering all aspects of intermediate filaments including protein isolation and structure, protein and gene regulation, relationship to disease and apoptosis, and associated proteins. Both mammalian and non-mammalian systems and animal models are covered, making this book a must-have for any investigator wishing to study IF genes or their protein products. Practical and user-friendly with detailed "how-to-protocols and "tricks of the trade"
Cell biologists, pharmacologists, and researchers in biological, biophysical or biomedical sciences. Palo Alto VA Medical Center, Stanford University, Palo Alto, California, U.S.A.